This dish is a play on the classic pappardelle al ragù di cinghiale. Since I had made a big batch of the sous-vide version of wild boar ragù, I thought it would be fun to stuff ravioli with the solid part of the ragù, mixed with pecorino cheese. 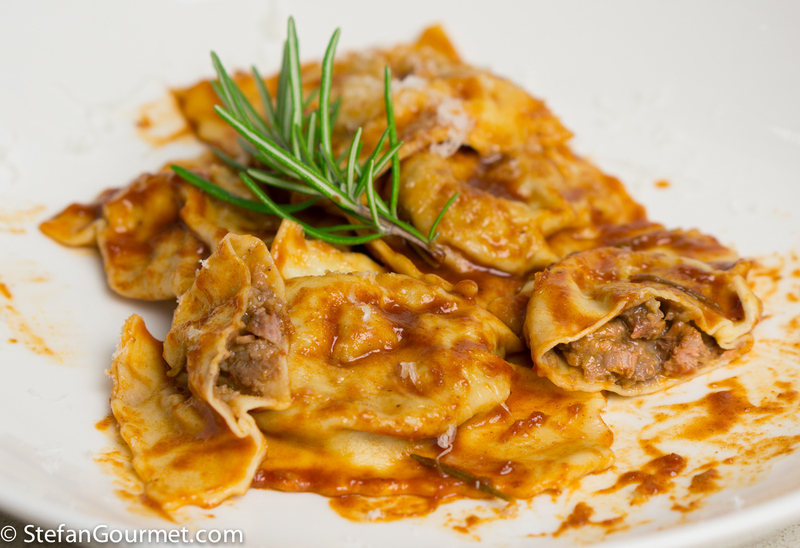 I served the ravioli with a simple sauce of the liquid part of the ragù, enhanced with some stock and tomato paste. 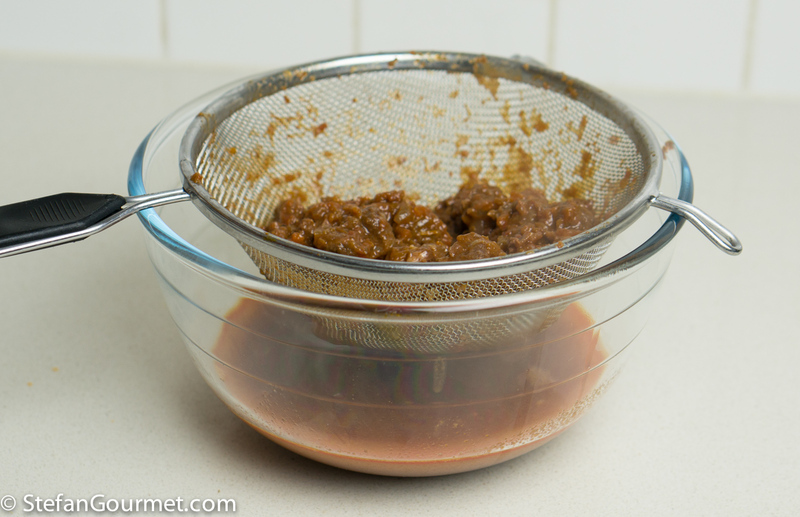 Start by separating the solids from the liquids of the ragù using a sieve. If you made the classic ragù and you made it real thick, you may have to dilute it with pork stock first. 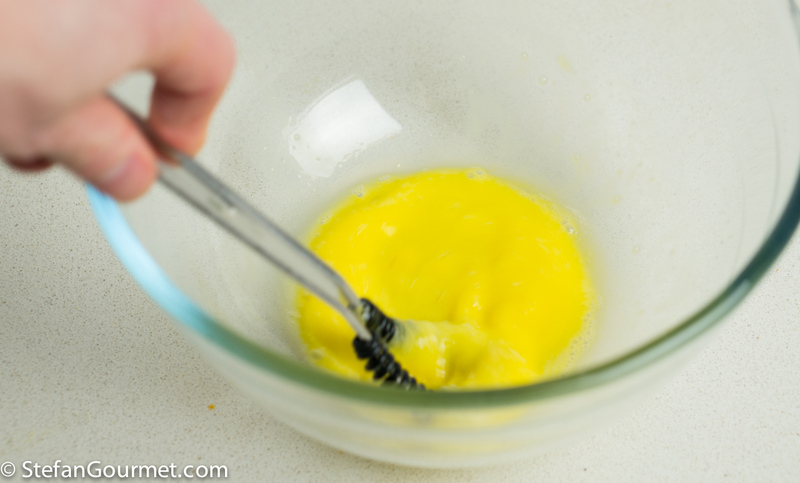 Beat an egg in a large bowl. 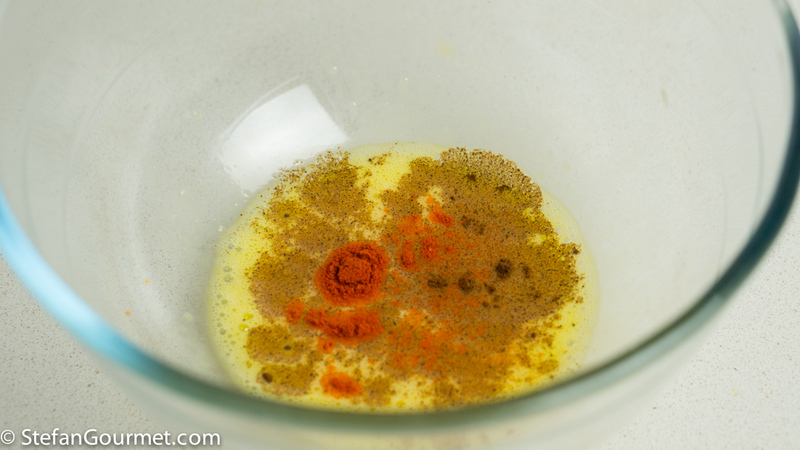 Add 1/8 tsp cayenne pepper and 1/8 tsp ground cloves. 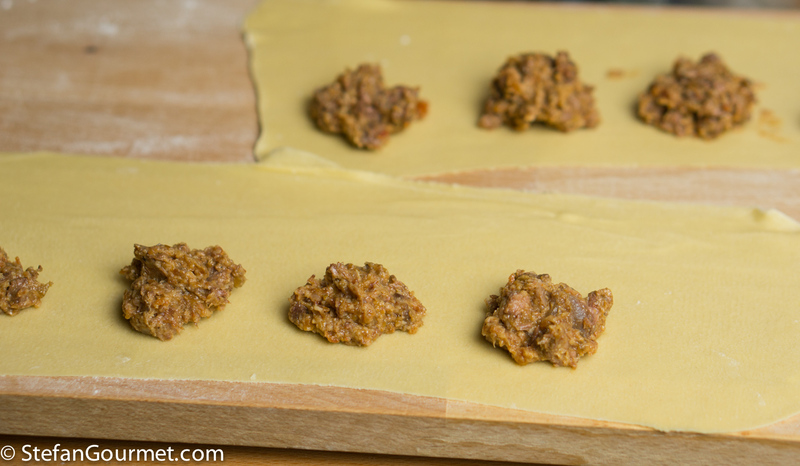 As usual with ravioli, a bit of extra flavor is needed to make the filling stand out. 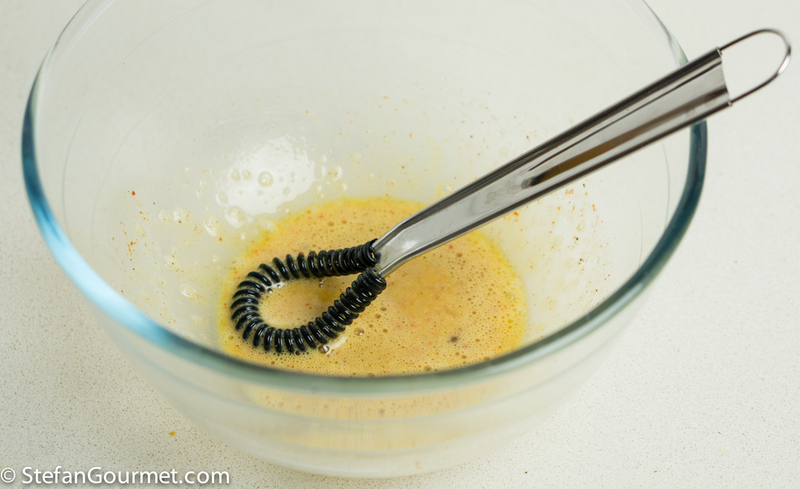 Whisk to mix the spices into the egg. 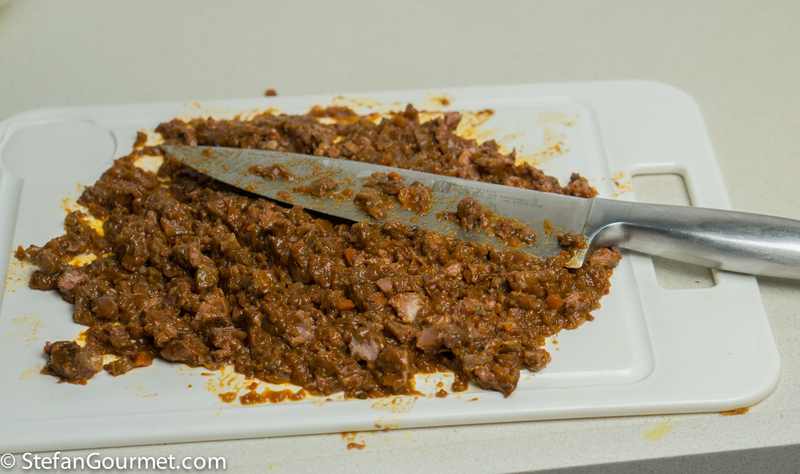 Mince the meat from the ragù. 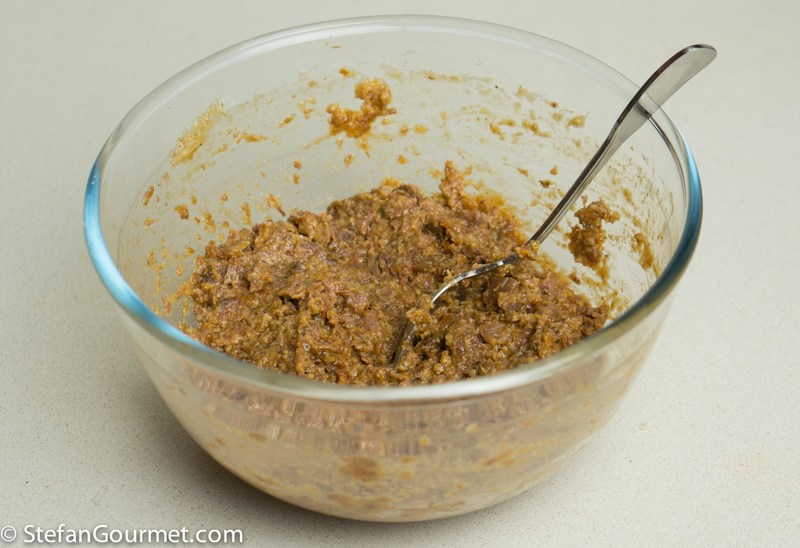 For a nice texture, it is better to use a knife than a food processor. 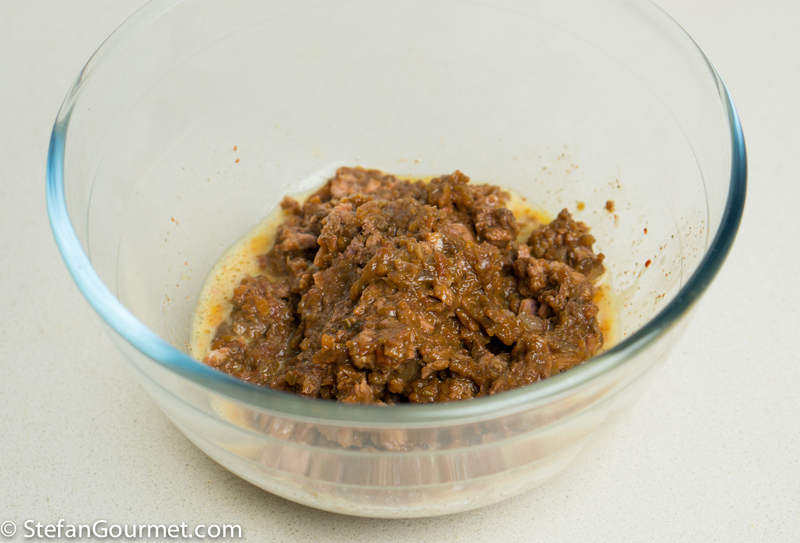 Add the minced meat to the egg mixture. 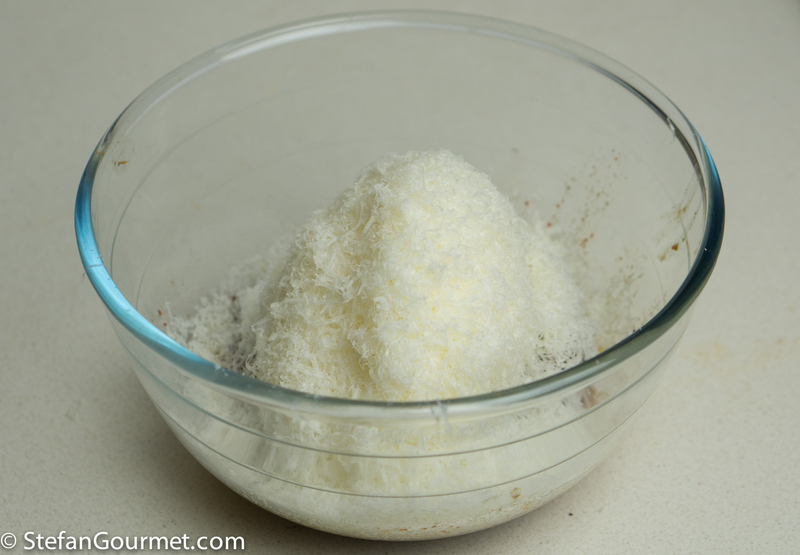 Add 80 grams (3 oz) of freshly grated pecorino. Try to find pecorino with more flavor and less salt than the usual pecorino romano, like pecorino toscano or pecorino sardo. Stir to mix. Taste and adjust the seasoning with salt and freshly ground black pepper. It should taste a bit more seasoned than you think it needs to be. Cover and refrigerate the filling to allow it to firm up. 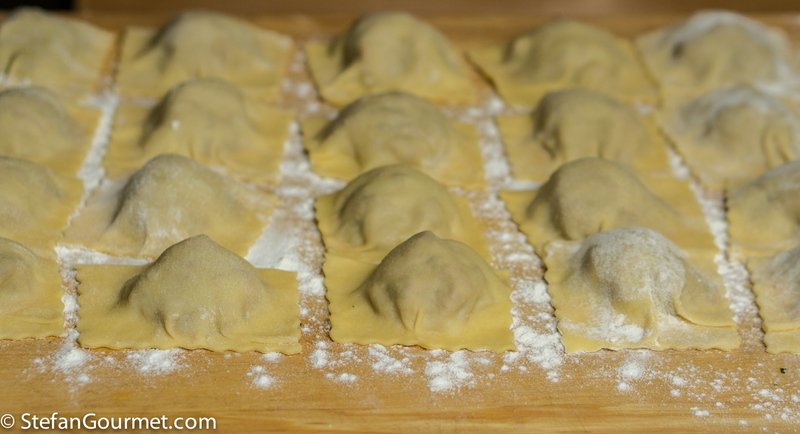 Make 2 eggs of pasta dough, allow it to rest, roll it out thinly, and shape into ravioli. 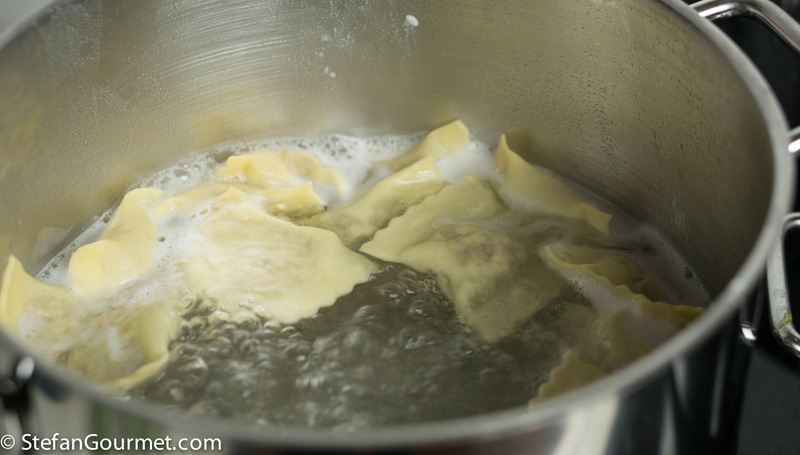 When the ravioli are finished, bring a large pot of water to a boil while you make the simple sauce. 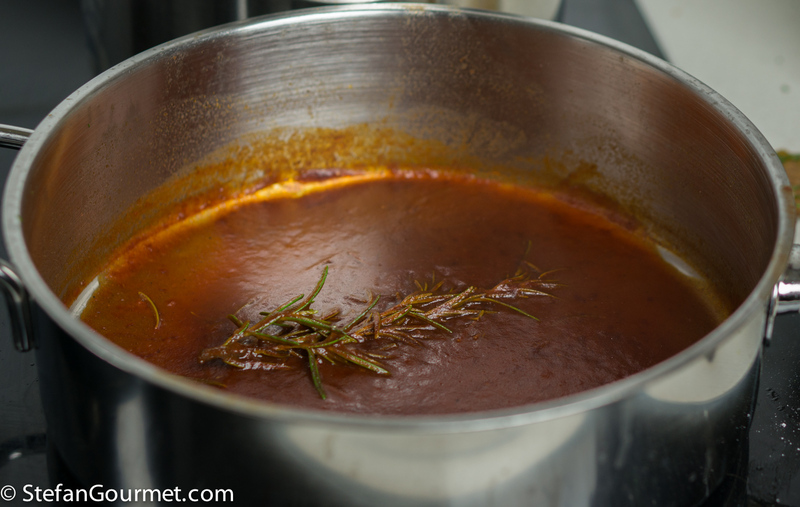 For the sauce, put the liquid part of the ragù in a pan together with 125 ml (1/2 cup) of stock, a sprig of rosemary, and a tablespoon of tomato paste. Bring this to a boil, then simmer until reduced by about half. 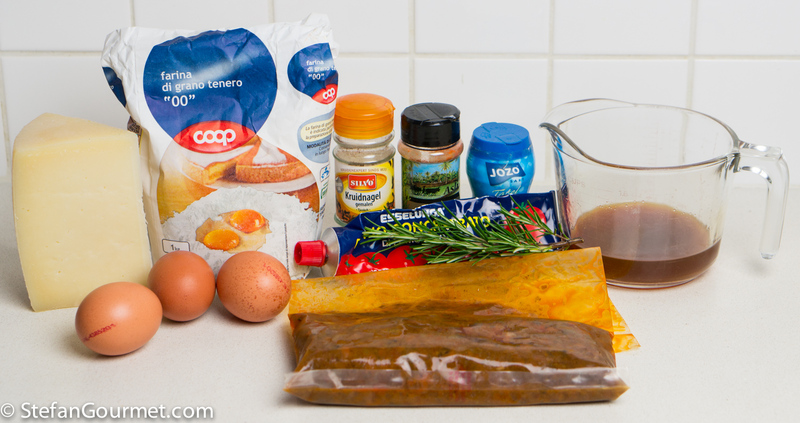 Keep warm over very low heat and remove the rosemary. When the water boils, add salt and the ravioli. Cook them for 2-3 minutes. 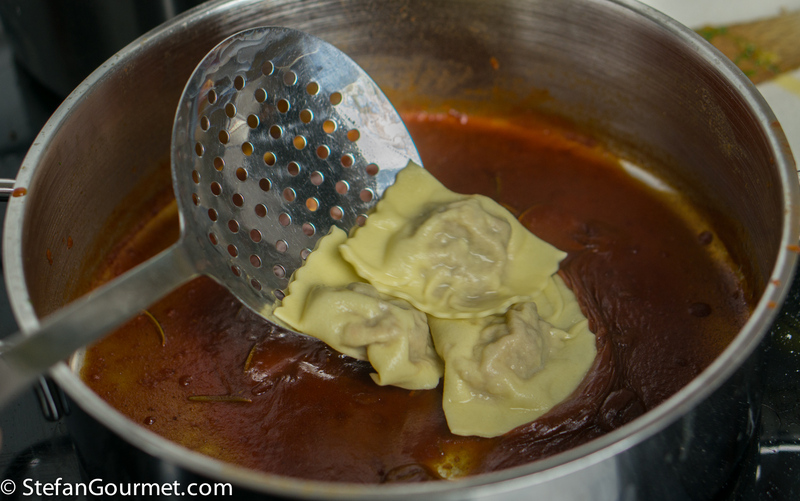 When the ravioli are cooked, transfer them to the sauce with a strainer. 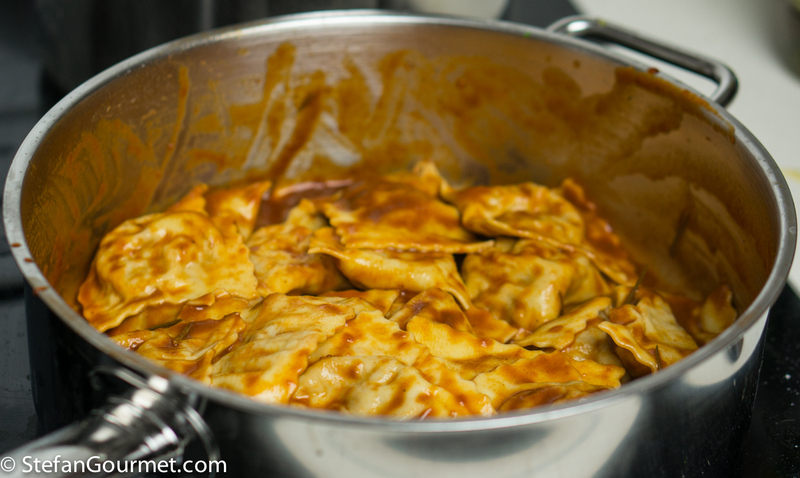 When you’ve added all the ravioli to the sauce, toss them gently to coat them with the sauce. 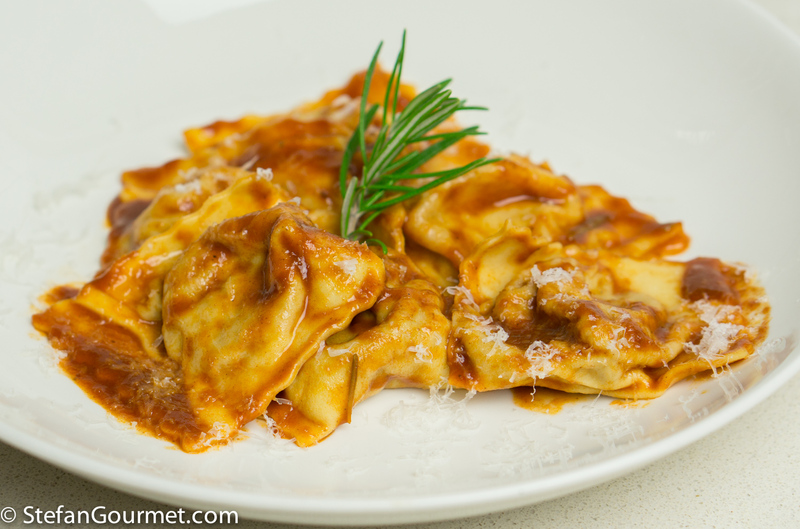 Serve the ravioli on preheated plates, and sprinkle with freshly grated pecorino. 6 ravioli is a sufficient portion size for a primo piatto as part of a larger menu that also includes antipasto and secondo. No surprises here, the same wine pairing as recommended with the ragù: a medium-bodied red from Tuscany or Umbria such as Chianti Classico, Rosso di Montalcino or Rosso di Montefalco. Doesn’t this look great? 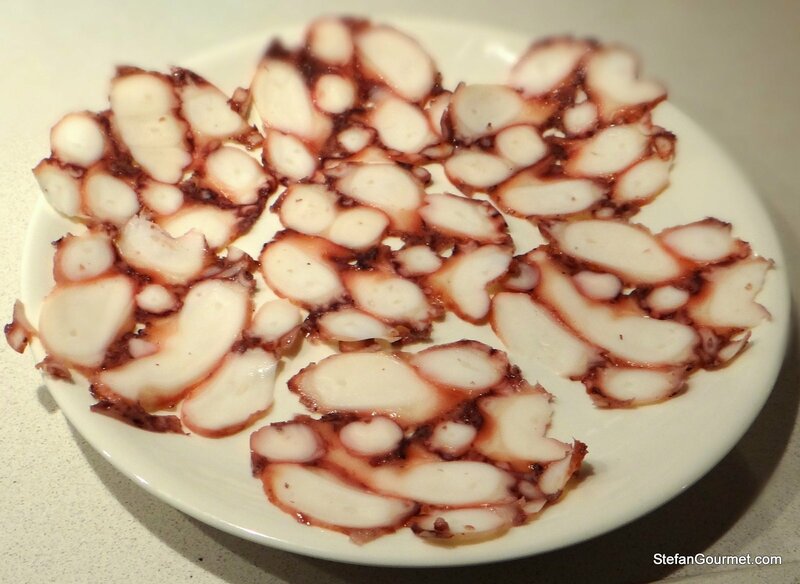 It is tasty as well: octopus carpaccio, with the octopus cooked sous-vide and then ‘glued’ using transglutaminase. Accipicchia, la farina Coop come quella che usiamo noi mortali! Ovvio che scherzo. Sei sempre un maghetto!